Follow this guide to get your first payout! 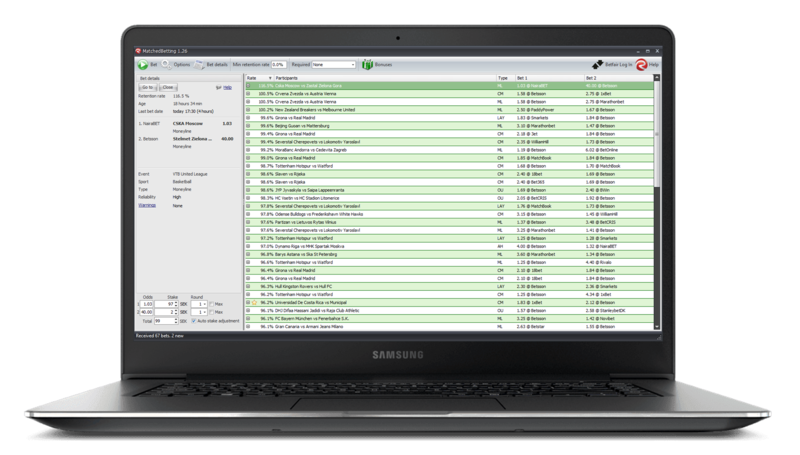 Download the MatchedBetting software and register. If you have a RebelBetting username, you can use that to log in. Click the button at the top called Bonuses. On this page we maintain a list of current bonuses available at the bookmakers. You will also be notified inside MatchedBetting when new bonuses arrive! Select a few bonuses that sound attractive. The easiest to start with is the Freebets. Look for high bonus amounts and multiply them with the payout percentage. (A 100% €100 bonus is more valuable than a 25% €200 bonus). Always read the bonus terms very carefully. They might not apply to residents from your country or have other requirements rendering the bonus useless for you. Also, the registration process (and bonus application) can only be done once, so make sure you follow their instructions carefully. Often a bonus requires that the money is rolled over a specified number of times before a withdrawal can be requested. This means you need to make a certain amount of bets before you are allowed to withdraw your bonus. Bookmakers do this to lower their risk of having to pay out bonuses because most players lose the money sooner or later. However, as a MatchedBetting customer, you don’t have to worry about this, you will always cash your bonus! This is because you don’t gamble your money, you make an arbitrage trade between another bookmaker, ensuring you keep close to (and sometimes over) 100% of the bonus no matter the outcome of the match. Not familiar with arbitrage trading? You can effectively turn gambling into an investment by using sports arbitrage trading. The secret is to bet on all outcomes of a game, betting two different bookmakers. If the odds are sufficiently high, you will be guaranteed a profit no matter who wins the game. The MatchedBetting software is based on the worlds leading sports arbitrage software, RebelBetting. After you have registered on a few bookmakers, you need to enter the bonus details into the MatchedBetting options so we can correctly display your current bonus offers, and help with the calculations so you don’t have to think at all. (Just kidding. But at least you don’t have to do any calculations in your head). Click on Options then Bookmakers. You will see a list of all bookmakers and you can select what bonuses you have active. Click on image to enlarge. Here we show a Deposit bonus at Tipico with a required minimum odds of 2.0. The first checkbox shows your enabled bookmakers, here you can select the bookmakers you have funded. The second checkbox means “Required”, here you can select the bookmakers which must be present in at least one outcome of the matched bet. Deposit bonuses are pretty self-explanatory. For free bets, you will have to read the bonus terms to see if the stake is returned or not (usually it’s a stake not returned free bet). Read all about the different bonus types here. Some bookmakers also require you to bet on a minimum odds (usually odds around 2.0), otherwise, the bet does not count towards the rollover requirements. This is just another trick bookmakers use to minimize their risk. This is no problem for you however, there are usually plenty of odds available anyway. Enter this number in the bookmaker options and lower odds will be automatically hidden in the list of available matched bets. A bookmaker with a bonus selected will automatically be set as “Required”. This will ensure your list of matched bets will only contain at least one bookmaker where you actually have a bonus. 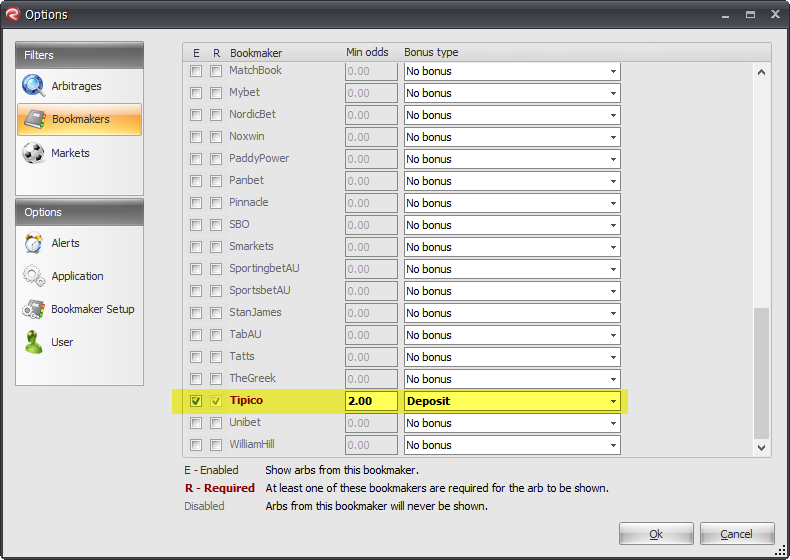 You can also click on Bookmaker Setup in the options screen. Set your active currency you use on each bookmaker (always try to have the same currency on all bookmakers though), and enter your username and password to use the AutoLogin and AutoSurf which speeds up betting a tremendously. Now you’re all set and ready to place your first matched bet. The list should be showing the highest “retention rate” at the top. If not just press the column header called “Rate”. Retention rate means how much of the bonus you will retain when betting on these odds. Read more about retention rate and how to calculate your profits. The calculator in the bottom left will tell you how much to bet on each side, and how much profit you will make from the *bonus*. For instance, if you have a €25 (stake not returned) free bet at WillHill, and enter the stake 25 for that bet, the Profit amount is what you will get back from your €25 bonus. Now select a suitable matched bet, the highest possible on two bookmakers where you have deposited money. Click Bet, and the Betting Browser will open. The AutoLogin and AutoSurf immediately take you to the correct page. It’s now important to verify that the odds are indeed correct and haven’t changed. Also, verify participants and odds type before entering your suggested stake and confirming your bets. We suggest beginners bet small amounts in the beginning to get a feel for this. Also, if it is a free bet, don’t bet more than the free bet amount! Again, read the bookmakers’ bonus terms. It’s also strongly advised you read our e-book which explains all this in much greater detail, explains the risks and how to overcome them, and gives you advanced betting tips that will help you earn more money. The e-book is aimed at RebelBetting, our sports arbitrage software, but most of the content is also relevant for MatchedBetting. Download the free e-book here. You have now placed your first matched bet and have made your first of hopefully many future profits. Good luck, and don’t hesitate to contact us if you have any questions. Also, make sure you join the exclusive RebelBetting Community. Get the latest updates, share ideas and discuss new features with us and your sports betting friends. Right now we have a special price of only €9 per month! This price is for a limited time only.